lt;stronggt;ECOEPBHC8WAlt;/stronggt;lt;BR/gt;ECO-PRODUCTS,INC. World Art Renewable Resource Compostable Hot Drink Cupslt;BR/gt;Attractive World Art design. Lined with Ingeo, a plant-based plastic, to prevent leaks. Interactive smart-phone scan-tag. Cup Type: Hot Capacity Volume: 8 oz Materials: Paper/PLA Colors: Plum.lt;BR/gt;lt;BR/gt;lt;stronggt;BUN1M5002lt;/stronggt;lt;BR/gt;ECO-PRODUCTS,INC. 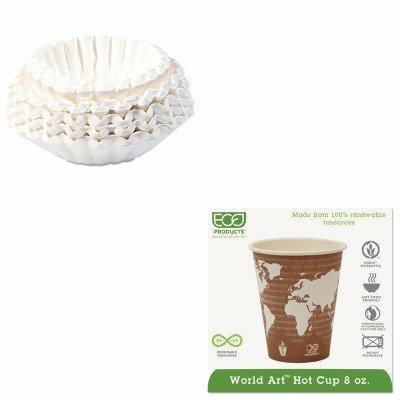 World Art Renewable Resource Compostable Hot Drink Cupslt;BR/gt;Fits 1.5-gallon coffee brewers. Stay-in-place design. Special paper assures optimum brew. Number of Cups: 12 Materials: Paper Shape: Flat Bottom. If you have any questions about this product by Eco-Products, Inc, contact us by completing and submitting the form below. If you are looking for a specif part number, please include it with your message.